Belli is a smart pregnancy tracker designed to measure contractions so expecting mothers always have a handle on how their pregnancy is progressing. The third trimester of pregnancy can be a trying experience for any expecting mother, especially with a first pregnancy, when almost everything is an unknown. There is now a smart wearable pregnancy tracker called Belli, created by Bloomlife, that provides peace of mind, and a whole lot of valuable data. The device and companion app is designed to detect, track and analyze contractions to help take the guesswork out of the critical stages of pregnancy. To use the device, users simply have to attach the Belli pregnancy tracker sensor to a Belli patch, attach the patch to clean, dry skin, and then sync up the smartphone app to get the wheels turning. The patch is made from a gentle silicone that is easy to remove and reapply. People with allergies to surgical tape or band-aids may experience an adverse reaction, but otherwise it should cause no irritation to the skin. The companion mobile app, in real time, tracks and displays essential information such as heart beats per minute, contractions per hour, total contractions, and time between contractions. In three separate clinical trials, it was shown that the system could detect contractions as accurately as hospital-based systems (the website, however, specifically mentions that Belli is only for informational purposes and isn’t intended to replace a doctor). As far as safety goes, the device has passed FCC and IC certification. Unlike ultrasound and Doppler systems, there’s no energy transmitted into the body—it only passively “listens” at the surface of the skin, and the device connects to the user’s smartphone using Bluetooth with a connection requiring 100x less power than standard cell signals. Additional tests also demonstrated specific absorption rates (SAR) that are more than 1000x lower than the safe limit value defined by FCC. Personal experience and referrals are paramount for a product that gets this close to a vulnerable new life, so Bloomlife has added several testimonials and stories to their website from parents, midwives, birth educators, and birth doulas. From all perspectives, the pregnancy tracker seems to be getting overwhelmingly positive feedback. Not to mention a few awards along the way from bodies and competitions like Extreme Tech Challenge and the 2016 National Parenting Product Awards. On top of helping their own cause, users also can opt to share their data with the Preterm Birth Initiative at University of California San Francisco to help researchers reduce the impact of preterm births worldwide. The amount of real-time data from a consistently worn monitor could help doctors understand and unlock new treatments for birth defects. 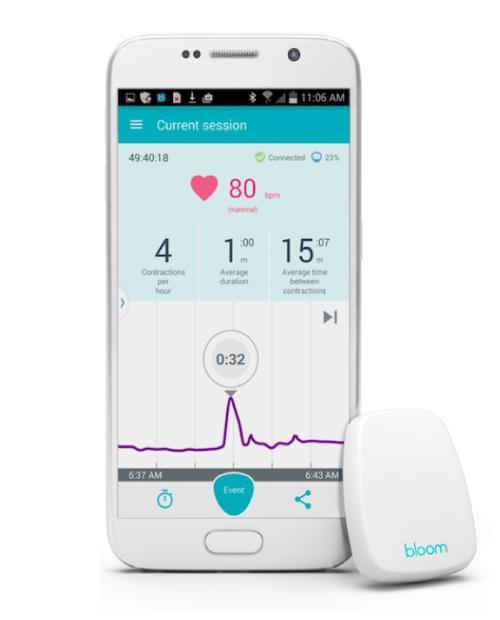 At the moment, Bloomlife has an early access program available for $29/week; this includes a Belli sensor with a charging cable, five Belli patches, and a quick-start guide. Users are able to cancel their rental at any time by returning Belli in the included prepaid envelope. According to the Bloom Life team, we can expect to see stress, sleep, kick count, and activity tracking built-in to the device in the near future. As of this past month, they now have over $4 million in total equity funding to make it happen. So many startups are aiming at the health industry. That is a great thing and the more people are aware of their own health, or pregnancy is a great thing. So you can use this information for good things as well. I am always prepared, so this would fit nicely on my smartphone. For piece of mind I can see this being a benefit, especially to a new mother. However, after the second kid, you are not going to be too worried about things like this.